Not much to say. Auntie Shoe is the graphics designer formerly known as AmeriYank, who has shops at print on demand sites all over the Internet. This is my first post on my brand new blog! Just want to say “howdy” and let you all know that there will be much more soon about all my shops and other stuff. 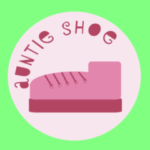 Thanks to my cousins and “Shopaholicchick” for their advice on my new persona of “Auntie Shoe” as well as the logo. So, HELLO, WORLD, and LOOK OUT, Auntie Shoe is here! Author Auntie ShoePosted on April 26, 2013 April 30, 2013 Categories UncategorizedLeave a comment on Hello, from Auntie Shoe!